Saints Row IV will be sticking to current-gen consoles to make sure it gets the development attention it deserves. Crafting a launch title for a new console generation isn't easy. Not only is the team working with unfamiliar hardware, there's also a strict deadline to finish the game in time for the system to hit shelves. With Saints Row IV scheduled for a release during the transition from this console generation to the next, developer Volition had a decision to make about which consoles to put the game on - and it chose the current generation, where the game could get the attention it needed to be successful. Volition developed Summoner as a PS2 launch title, and wasn't happy with how it turned out. Needless to say, the team wants to avoid repeating that mistake. 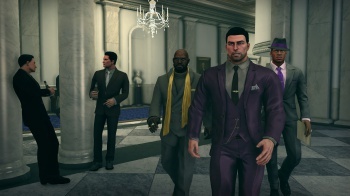 "We'd been working on [Saints Row IV] for a little while and hearing the rumors about the timeline the new consoles might come out," says Volition's Jim Boone. "The big thing for us was, we wanted to make sure we had time to do the game right." The first Saints Row also passed up a chance to be a launch title in favor of avoiding development rush, and it worked well for Volition. "Saints Row 1 was the blueprint," Boone says. "Doing what's right for the game rather than rushing to get something out." Saints Row IV is headed to PS3, Xbox 360, and PC on August 20.